FILE PHOTO: Flags of U.
SHANGHAI/WASHINGTON (Reuters) - China's foreign ministry on Saturday summoned the U.S. ambassador in Beijing to protest Washington's decision to sanction a Chinese military agency and its director for purchasing Russian fighter jets and an advanced surface-to-air missile system. Chinese Deputy Foreign Minister Zheng Zeguang summoned Ambassador Terry Branstad to lodge "stern representations" and protest the sanctions, the foreign ministry said. Earlier, Chinese defense ministry spokesman Wu Qian said China's decision to buy fighter jets and missile systems from Russia was a normal act of cooperation between sovereign countries, and the United States had "no right to interfere". 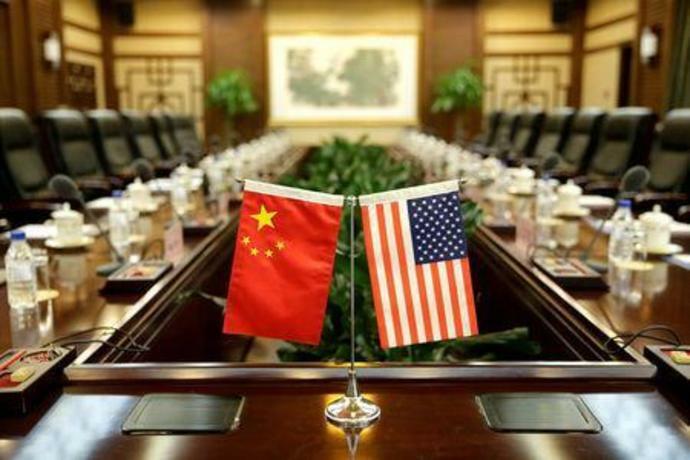 On Thursday, the U.S. State Department imposed sanctions on China's Equipment Development Department (EED), the branch of the military responsible for weapons procurement, after it engaged in "significant transactions" with Rosoboronexport, Russia's main arms exporter. A senior U.S. State Department official on Saturday said China was the only country that had taken possession of the advanced S-400 surface-to-air missile system, in a breach of a U.S. sanctions law imposed in response to Russia's "malign behavior". The so-called Countering America's Adversaries Through Sanctions Act, or CAATSA, was signed into law in 2017 to punish Russia for meddling in U.S. elections, aggression in Ukraine and involvement in Syria's civil war. The mobile S-400 batteries, which include radars, a control system, and missiles with a range of up to 250 miles (402.34 km), was first deployed in Russia in 2007 and is considered Moscow's most effective defense against aircraft, missiles and drones. Washington has expressed concern that Turkey's planned deployment of S-400s could threaten some U.S.-made weapons and other technology used by Turkey, including the F-35 fighter jet. The official said the move against the Chinese agency was not discretionary, but was made because Beijing broke U.S. law. "We hope it will be paid attention to because ... our goal is to prevent these types of transactions," he added. The U.S. sanctions will block the EED and its director, Li Shangfu, from applying for export licenses and participating in the U.S. financial system. "The U.S. approach is a blatant violation of the basic norms of international relations, a full manifestation of hegemony, and a serious breach of the relations between the two countries and their two militaries," Wu said in a notice posted on the Chinese defense ministry's official Wechat account.